Ebooks are an excellent product for an online business to sell. They can be created with very little expense using common and free software. There is almost no cost involved to duplicate and deliver an ebook and the entire sales and delivery process can be automated. The profit margins can be good (even for inexpensive products) and they can be excellent if you choose the right topic. But, the whole process of selling online can be intimidating for the first-time publisher. The term 'infoprenuer' has been coined to describe people who sell information based products like ebooks. In order to get started selling online you need 3 things: a website that promotes your product, a method of receiving payments, and a method to deliver the product to your customer after payment. Your promotional website should not be a complicated site. It should be a one page HTML document that is focused on selling your product (you've probably encountered many of these 'salespage' style sites on the web.) The content will consist of a headline to catch people's attention, a short story to hook them and get them reading, a bullet list of the major benefits they will get from buying your product, testimonials from previous customers and reviewers, and a 'call to action' (otherwise known as the sales pitch.) Most people include a P.S. or two that summarizes the major benefits and repeats the call to action. You don't need any fancy software to make this page. There is an excellent free software package called Kompozer that will help you design the webpage. In order for people to find and access your salespage, you will need a server to 'host' it on and a domain name. There are dozens of companies that will help you with domain name registration and hosting if you don't already have this taken care of. The total cost should be under $10US per month. I use and recommend 2 companies: HostGator Web Hosting and 1&1 Web Hosting. Your salespage will have an order button on it for customers to click and purchase your ebook. This will link to some kind of online payment processor. Large businesses have accounts with a bank called 'merchant accounts.' These accounts allow them to accept credit card payments from customers. Unfortunately, merchant accounts are expensive and can be difficult to setup for new businesses. Luckily, there is a very popular online alternative... Paypal. A PayPal Premier or Business account can be setup easily by almost anyone. There are no monthly charges for a Premier account and PayPal charges a small transaction fee for every payment the process (merchant accounts have large monthly fees and transaction fees as well!) With a PayPal Premier or Business account, you will be able to accept credit card payments, electronic checks, and direct PayPal transfers from other members. It is the easiest way to get started accepting payments online. PayPal includes tools on their merchant services area where you can create a 'Buy Now' button to place on your salespage. The form is very easy to use. Simply fill in all of the details about your product. Make sure that the 'button encryption' option is set to yes. If it is not, anyone with basic web skills can view the source code for your salespage and change the purchase price or simply steal the link to your download page without paying. Even worse, search engines will eventually find and index your download page. If you choose this low-tech approach, make sure to put a blank file named 'index.htm' in each folder and also include 'no-index' tags in the header of the HTML of the download page and never link directly to the download page from anywhere online except from PayPal. These steps will reduce the chances of non-paying people downloading your product and search engines from indexing your download page and product links. But, if someone does find the page, this offers no protection from theft. There are some more sophisticated software solutions available that will verify payment information before allowing access to download pages and files and will create a unique link to the product that hides its true location on your server and expires after a certain length of time or number of downloads. They might also include tools for running an affiliate program. DLGuard, Digital Product Guard Download System, and Download Defender XT are some of the more popular options for download protection. These software solutions will cost you money and take some expertise (your own or someone you hire) to set everything up. But, in the long run, they will protect you as your business grows. A third option for delivering your products is to use a hosted shopping cart program. This is the approach I use in my business. There are a number of services at wildly different pricing structures that can handle this task. I use a company called E-junkie that is very inexpensive and offers almost every option I need to run a highly automated online business. They have a free one week trial and they don't have any transaction fees to cut into your profits. ClickBank, PayDotCom, and PayLoadz are other popular shopping cart options. The fee structures vary with each service. The most important decision you can make for your online business is to decide to start and take action. If you have to start small and cheap - do it. Use free tools and low tech solutions and take the money you earn and invest in better technology. If you wait for everything to be perfect, you will never start. I recommend using Paypal and E-junkie to take payments and deliver products. The monthly fees are tiny and the technical skills required to deliver a secure product are low. E-junkie will make the buttons, send the thank-you emails, create the secure download pages and deliver the products. They even have tools for running an affiliate program. Take action and have a profitable day! 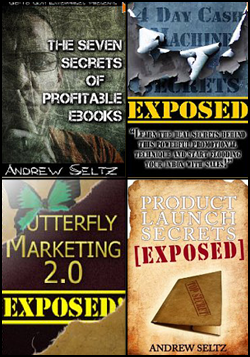 Andrew Seltz is the author of "Selling Digital Goods Online with E-Junkie," an illustrated step-by-step guide to setting up your ebook business fast. Ebook templates save lots of time for any author planning to create a significant number of them. As an information publisher, the ebook and e-report are the basics of my business and I create a lot of them. Speed of creation and a professional look are extremely important to me and setting all of this up is one of the more tedious and time-consuming aspects of ebook creation. To speed the process and maintain a high quality product, I built an ebook template in Open Office that I use for all of my ebooks. Open Office is a free office suite software package that includes a first-rate word processor. This word processor also has a high quality PDF exporter built into the software which creates beautiful ebooks for your business. It is my favorite software to use. The basic settings I modify for my ebook template are the fonts, the font sizes, the line spacing, a page header, a page footer, and a few other bits of 'boilerplate' content. I also like to put a border around the pages to dress it up a bit. Font size for my ebooks is set to 14pt and the line spacing to 1.5 or 2. It's important to remember that many people will be reading the content from the screen and a larger font is easier on the eyes. The increased line spacing also helps with on screen readability. These settings also look pretty good when printed, so it is a good compromise. For fonts, I use a sans-serif font for the headings and titles and usually pick Times Roman or Bookman for the body copy. Next comes the header and footer for all of the main pages. The header usually contains the name of the ebook and the footer has a promo teaser on the left and the page number on the right. Some people like to include copyright information at the bottom of every page as well. I also like to separate the header and footer from the main text with a divider line. Finally, I create some boilerplate legal pages, an index page, a resource page and an about the author page to round everything out. These might get modified from book to book, but they are always present in every book so it saves time to have them as part of my template file. It took a little while to figure out the nuances of creating page styles in OpenOffice, but now this it's done and I've built the framework for my ebooks, I just cut and paste content into my template. Working this way easily saves 1 to 2 hours on every single project.